If you're flying through Minneapolis-St. Paul International Airport this fall, keep an eye out for Vincent van Gogh's "Olive Trees" from your airplane window. 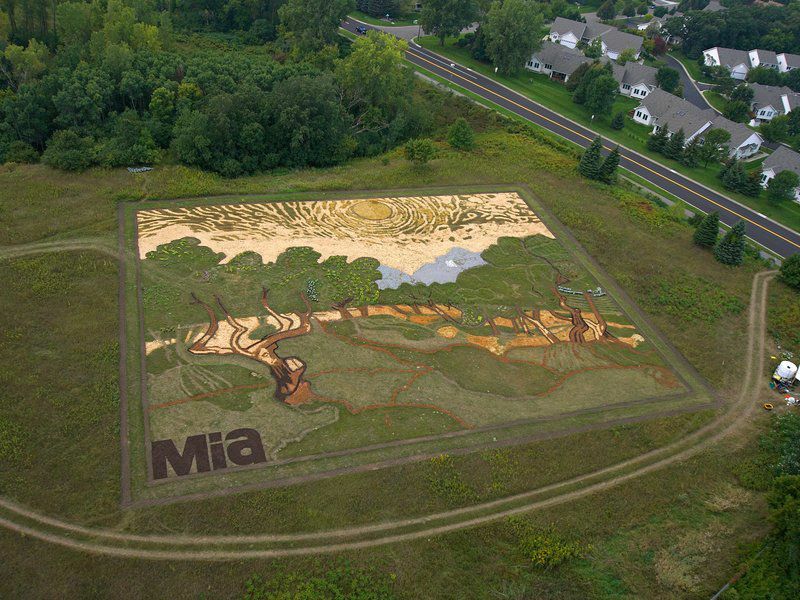 It won't be hard to miss - this aerial crop art covers more than an acre of land. Van Gogh painted "Olive Trees" in 1889. It was one of many paintings he created featuring olive trees as a subject; he painted 15 alone between June and December of 1889. The one seen on the field is part of the collection at the Minneapolis Institute of Art in Minnesota. The strong hues of yellow in the painting would suggest that the picture represents the olive trees in the autumn months. Van Gogh wrote to his brother, Theo, about using the trees as a subject, saying that he struggled to "catch (the olive trees). They are old silver, sometimes with more blue in them, sometimes greenish, bronzed, fading white above a soil which is yellow, pink, violet tinted orange...very difficult." The unique ode to van Gogh is the work of landscape artist Stan Herd, reports Mary Abbe for the Star Tribune. It was commissioned to honor two milestones: the Minneapolis Institute of Art's centennial and the 125th anniversary of van Gogh's death. "It's an iteration of van Gogh's painting writ large in native plants and materials," Herd tells Abbe. "The opportunity to engage with one of my favorite artists in the world was pretty unique for me." It took Herd six months of digging and planting to recreate van Gogh's 1889 painting, which is currently on display at the MIA. To mimic the artist's iconic brushwork, Herd grew patches of pumpkins, squash, watermelons and cantaloupes while arranging mulch, rocks and soil to create darker lines, according to Nick Mafi at Architectural Digest. 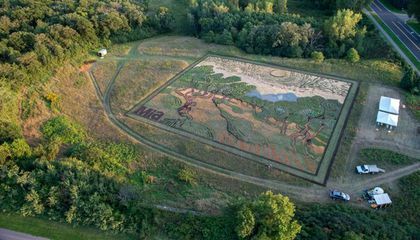 Herd first started making crop art, which he calls "earthworks," in 1981. His first project was a 160-acre portrait of the Kiowa chief Satanta and in the decades since, he has created dozens of larger-than-life pieces around the world. Though "Olive Trees" will be on display through the fall, Herd plans to mow it down in concentric circles to mimic van Gogh's brushstrokes, Christopher Jobson reports for Colossal. Stan Herd, Of Us and Art: The 100 Videos Project, Episode 30 from Minneapolis Institute of Art on Vimeo. Why did Stan Herd use pumpkins, watermelons and squash instead of something else? How does he do that? That is crazy!!! this painting is unique and very interesting painting because there is not one strait line because every thing is swaying perfectly and it's just natural (literally). Herd wanted to use a different and unique style of art. He also wanted to somewhat follow in Van Gogh's footsteps. Herd is a landscape artist, so his first objective is probably to use "paint" that's suitable for the land. Therefore, the colors of the pumpkins, squash, and watermelon was his prime choice to complete the painting. He used pumpkins, watermelons and squash so the colors would stand out and so the art piece would be unique. Stan Herd used pumpkins, watermelons and squash instead so something else because he wanted make it look natural.